Most commonly used to strengthen retaining walls, biaxial geogrid can be rolled in either direction and retain it's strength. The following provides guidance for installation a retaining wall when using blocks from Allen Block. 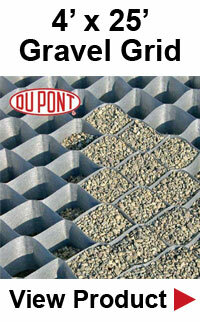 If your project involves stabilizing slopes or earth retention you will need to use geogrid. Geogrid is a synthetic, flexible mesh that is specifically made for these purposes. 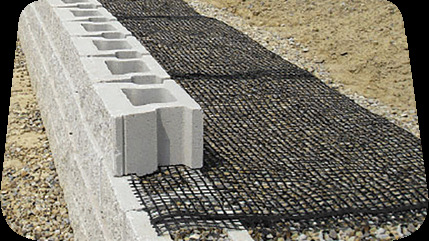 Geogrid comes in an array of materials, strengths, and sizes. They are made of plastic that is woven polyester or high tensile strength that is provided in rolls. It is available in both uniaxial and biaxial form. Biaxial geogrid is most commonly used in projects where the retaining wall is under 10 feet. Biaxial geogrid can be rolled both in the direction of the wall or away from the wall and will still remain strength where uniaxial can only be rolled out in one direction for it's reinforcement properties to stay intact. First, you should use the Soil Reinforcement Chart in order to determine the size of AB grid you will need and how many layers will be required for your retaining wall. You will want to perform a few tests, to begin with. Take two cylinders, one that has compacted material and the second that has compacted material along with mesh that represents geogrid. Take both cylinders and apply vertical force to see how the soil reacts. Once you have completed the foundation, start installing the first layer of Reinforcement Grid. 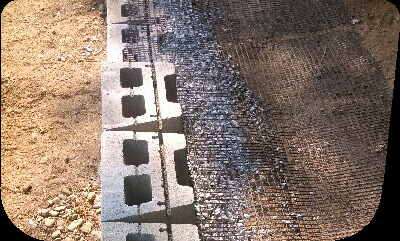 Using either AB Aztec or AB Europa, place the edge of the geogrid up against the back of the raised front edge and roll it out along the wall. Place the edge of the geogrid in the middle of the facing unit for AB Fieldstone. You should always refer to your plans to know the exact location and size. The next step, place the block in order for the seams to counterbalance from the blocks by at least 1/4 in length Observe the line of the retaining wall for alignment. You may adjust the blocks somewhat to form a straight line. Take the back of the geogrid and pull on it in order to remove any slack and if required, stake it into place. Never compact or drive on the geogrid or you will damage it. Install the wall rock in the block cores, 12 inches (300mm) behind the block. Use the approved on-site soils or infill to backfill behind the wall rock to the exact height of the block. Make sure the wall rock and soil, behind the wall, is properly compacted by using a plate compactor. Compact in lifts of 8 inches (200mm) or less. Start on the blocks and work in the direction that is parallel to the block heading toward the back of the excavation area. Go over this with at least 2 passes with the plate compactor. The compaction should provide soil that is solid and free of any movement. Remove all excess material from the top surfaces of the blocks and ensure all surfaces are clean and smooth for the next step. At this point, continue installing your next level of blocks using the same steps as just mentioned. Using your plan, install the geogrid on every procedure of the retaining wall. Going through all the steps, complete the wall to the desired height. The last step, fill behind the blocks with an organic soil in place or the approved on-site soil. This will prevent water from running behind the blocks and help in plantings above the retaining wall. First off, refer to the approved plans for placing geogrid. Cut sections of the geogrid to the specified lengths as mentioned in the approved plans. Always check the manufacturer's grid specs for strength, roll or machine direction. After the foundation of blocks has been installed, roll out the geogrid starting in the center of the AB Fieldstone facing and then extend back to the excavated area. Stack the next set of blocks (facing/anchoring unit) in order for the blocks to be offset from the foundation blocks. Each of the procedures should be placed with the vertical seams offset by at least 3 inches (75mm) or ¼ the length of the blocks. Take the geogrid and pull to remove any slack and then stake in place before installation of the wall rock and the approved infill soil. Never run the compaction equipment on to the geogrid. If you'd like to give a unique look to your landscape, try applying a patterned wall. You can blend the different sizes of blocks together into the wall and create a hand-laid stone look. Choose from an array of pre-set patterns to create your wall or design your own. If you have walls that need reinforcement or are curved, you will have to construct with a two procedure pattern. In order to create a wall that looks like a hand-laid wall requires a good amount of craftsmanship and detail. This will require a certain amount of custom fitting of the blocks. You should allow for extra time to create this wall especially if you are doing this for the first time. You can use either the AB Europa or the AB Collection to create a pattern that is pre-set or irregular. A preset pattern is repeated every 2 or 3 sets of blocks. See the Pattern Chart for further details. A single procedure of one full-sized block should be around 8 inches (200mm) high. A level surface is required on the reinforced wall for an irregular pattern in order to properly install the geogrid. Always refer to your approved plan before the placement of geogrid. Walls with curves should always use the 2 procedure pattern to cut back on fitting and cutting. This also applies to wall requiring geogrid in order to ensure proper placement of the geogrid.